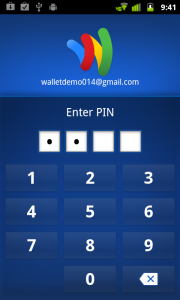 The much-anticipated Google Wallet app debuts today--for now, available only on the Sprint Nexus S 4G phone. The app is the latest to use Near Field Communications (NFC) technology to facilitate payments--customers pay for items in brick-and-mortar shops by tapping their phone to a vendor’s PayPass reader, a small box for transmitting data that can be found in major retailers like Macy’s, Whole Foods, and McDonald’s. 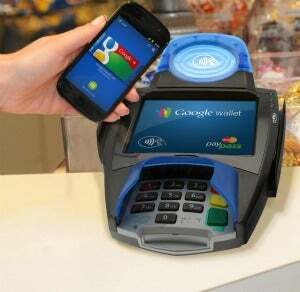 To get its app off the ground, Google partnered with MasterCard, which has been using NFC chips on some of its credit cards since 2003, and originally developed the PayPass reader. Currently PayPass readers are available mainly at major retailers, but a few small vendors in the San Francisco area do take PayPass--such as Cafe Blanco on Sutter Street in SF’s financial district. My first purchase was there, and I ordered a latte and a croissant. The manager of the store was working that morning and told me that many of his customers use his cafe’s PayPass reader with their NFC-enabled credit cards, and he’d never had any problems with receipt storage. On my end, paying was easy: The phone gave a quick vibration, and the reader beeped when the transaction happened.The purchase required a signature, so the manager printed out a receipt and I signed it. Having Google Wallet didn’t make the transaction itself any quicker, but it was easier just to reach for my phone to pay instead of digging around in my backpack for my physical wallet and credit card. I also had installed a bandwidth monitor to see just how much data the app would set you back per payment--248KB, as it turns out, which is about half of what it takes to upload a photo to Facebook from your phone. 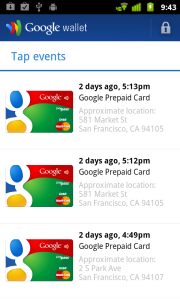 Luckily, Google Wallet doesn’t appear to be a data-eating beast. 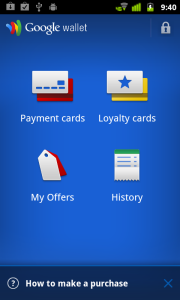 You can opt to link your Phone's GPS to your Google Wallet purchase history.